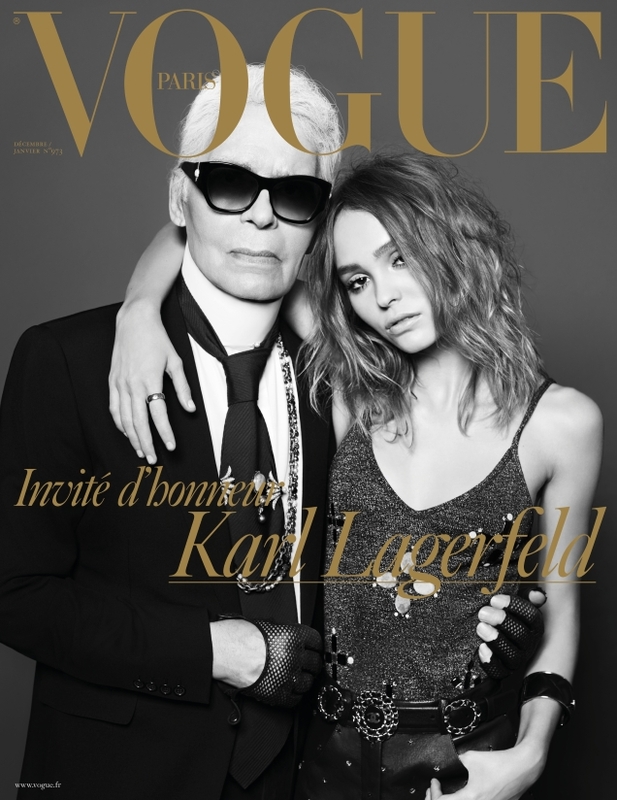 The holiday editions of Vogue Paris are usually a pretty big deal and it was announced on our forums in October that Karl Lagerfeld was scheduled to guest edit the magazine’s double holiday edition. Much to our delight, the Kaiser himself poses on the front cover for December – and who better to join him than girl-of-the-moment Lily-Rose Depp? The pair were photographed by Lagerfeld favorite Heidi Slimane for the occasion, captured in black and white (another Lagerfeld signature). It was only last year that her mother Vanessa Paradis guest edited the title and with Lily-Rose’s affiliation with Chanel, our forum members aren’t entirely surprised by the outcome. Members of our forums weren’t afraid to vent. “All this waiting for… this! Bored by Vogue Paris,” wrote CocoM. “Grandad and grandchild! The same boring concept à la Cindy [Crawford] with Kaia [Gerber] on Vogue Netherlands. Karl looks like he’s been to a plastic surgeon like Michael Jackson! Lily looks lovely but brings nothing extra. I expected more from Hedi, this is very bland from him: a standard family portrait,” said a disapproving Nymphaea. “Yikes, so unimpressive!! This looks like a candid from any of Chanel’s shows, just with a dull backdrop,” Benn98 exclaimed in utter shock. Also equally as unimpressed was Miss Dalloway. “Was excited that Karl edited, but this cover is such a letdown!! Sick of Lily on covers!! And why not a tad more festive?” she asked. “Looks like he’s helping her out of the club after way too many shots. What a lame cover,” Marc10 mocked. In agreement over how horrific the cover turned out was dfl-001. “Looking back at past guest editor December covers from Miro, Baryshnikov, David Hockney, Nelson Mandela; the December covers used to be so celebratory. This cover is just ghastly,” he slated. How do you feel about the cover? Boring or brilliant? Check out some previews and join the debate here.